Some artists feel like they’ve never reached their peak, or at least missed the chance to be on top of their game. Often this can be chalked up to one incredible track that was never capitalized on, or an album that showed a lot of promise before ultimately falling flat. Then there’s Kid Cudi, a man who took an entire genre and added a whole new set of sounds to it, influencing everyone from Kanye, to Drake, and countless rappers popping up everyday, yet he holds no classics, at least until Kanye and Cudi teamed up as KIDS SEE GHOSTS and allowed both Cudi and Kanye to realize their potential in the current state of music. Both Kanye West and Kid Cudi have made their careers off of the exploration of human extremes. Kanye often vacillates between manic and depressive, something we now know is due to a mental condition, and Kid Cudi has always looked for hope in the darkest of places, smothering his sadness with narcotics and autotune. 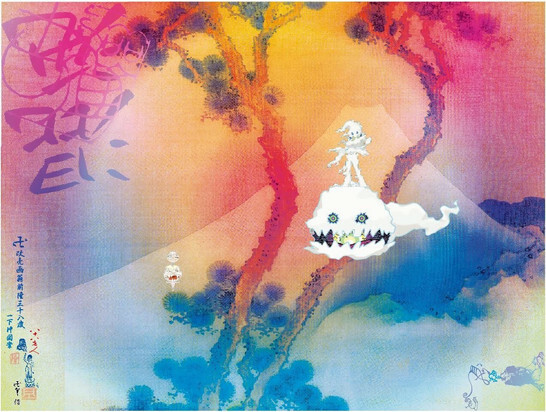 It makes sense then that as the duo Kids See Ghosts, they would carry on the tradition, and they do so by combining the best of their artistry to create a compact, watertight album that is more than worthy of AOTY consideration, and almost certainly the crowning achievement of Kid Cudi’s career. The album begins with Cudi crooning “I can still feel the love.” before launching into the only guest verse on the track. It’s surprising that the first rapper heard on this record is Pusha T a rapper who is definitively stoic, almost in direct opposition to Kanye and Cudi, yet his presence here works if only to lower your guard, as only seconds pass before Kanye manically shouts gun adlibs all over the track. “FEEL THE LOVE” however is more of an intro and “FIRE” is where the record begins in earnest. The track is centered around a fairly simple marching band style beat replete with snare and tambourine. What makes the beat stand out however, and what elevates many of the beats on the record is the excellent vocal sampling. Cudi hums over many of the tracks, and the guitar that he attempted on the disastrous Speedin Bullet 2 Heaven realizes its potential all over this album. There is often a single moment in an album where you can hear it turn from good to excellent. KIDS SEE GHOSTS does this in its third track “4TH DIMENSION” featuring Louis Prima, who is perhaps most well known for his role as King Louis in Disney’s classic The Jungle Book. On “4TH DIMENSION” his recognizable voice is used in a sampling capacity, beginning the track with a washed out, dilapidated feeling, not dissimilar to many of the beats from Jay-Z’s 4:44. Then the beat kicks in. To describe the moment the sample transitions is futile, it drops heavier, harder, and more effectively than even Pusha T’s “Come Back Baby” which featured the best beat kick in of the year to date. To make things even better, Kanye jumps on this beast like a lion, it’s easily his best flow since the days of My Beautiful Dark Twisted Fantasy and even though he may not “say” a lot in his verse, his creative use of inflections and meter over top a chest cracking beat make this one of the most memorable tracks of the year. Kid Cudi also turns in a solid verse that tiptoes the line between braggadocio and relatable excellently. “FREEEE (GHOST TOWN PT.2)” doesn’t quite live up to “Ghost Town” from Kanye’s ye but it does feature a fantastic intro that sounds straight out of MF DOOM’s catalogue. “REBORN” shows off some of Cudi’s vocal chops in a move that has been criticized by many. While his singing is occasionally off key, the laid back beat and heavy focus on Cudi’s lethargic hums and half sung verses is an excellent reminder of tracks from Man on the Moon. Closing out the record is the one-two punch of “KIDS SEE GHOSTS” and “CUDI MONTAGE” the former of which features a fantastic beat composed of high pitched mallets and a menacing bass hum that trembles just below the surface of the track like dark matter holding a galaxy together. In keeping with the paranormal feeling, the echoes of a Theremin titter along the edges of the beat, adding to a growing sense of unease that the album excels in propagating. Kanye again turns in an excellent verse on this track. His rapping is not quite as tight or proficient as it felt on “4TH DIMENSION” but it overtakes that verse in terms of content, lines like “Don’t like being questioned and don’t like being less then any competition in any of my professions.” Expanding the current narrative of Kanye as he reaches toward having a Daenerys-like list of titles. “CUDI MONTAGE” does exactly what you might think it will do and allows Kid Cudi to take the spotlight over the first verse and choruses. Outside of his verse, Kanye’s fingerprints can be felt all over the assembly of the track, adding a cohesion that Cudi has often lacked when composing his own material. The record closes out as the refrain of “Stay strong, save me Lord” with an ever growing bass rush threatening to rattle the track to pieces, adding a sense of emotional fragility that stops just moments before it overtakes the entirety of the track, allowing one last refrain of “Stay strong” to close out the record. While the album is fresh there is much debate to be had about how this record lands in Kanye and Cudi’s lexicon. It is almost certainly the strongest project from Cudi and may have the staying power to overtake Watch The Throne as Kanye’s strongest group performance. What is particularly interesting is the titling of this album and how it plays into the surgical summer. While at times ye felt half baked and hurriedly assembled, there are elements within it that make both DAYTONA and KIDS SEE GHOSTS make more sense. Essentially Kanye is choosing to step out of the limelight in these projects, as seen by his own album title being all lowercase while both his production and group projects are bold and capitalized. Kanye actively does not overtake this record from Cudi, and allows him ample room to both establish an artistic space for himself while embellishing it with his own flourishes. Whatever the case KIDS SEE GHOSTS is easily one of the most compelling listening experiences of the year, and feels well planned, well thought out, and carefully assembled in a way that a Kanye West project hasn’t felt since Yeezus.